Contact the research office if you would like a copy of the latest GWC Quick Facts and Scorecard posters. Golden West College Quick Facts is a one-page visual infographic to present data on enrollment, student characteristics, special programs, awards and transfer volume, tuition, financial aid, and college staffing. Quick Facts are updated every fall semester and includes information from the previous academic year. The GWC Fact Book is a reference manual containing data concerning the college’s service area, students, faculty, staff, instructional programs and services. Data and analysis contained in this volume provide background information to facilitate policy analysis and decision-making. Currently, the GWC Office of Institutional Effectiveness maintains Fact Book relevant data using Tableau, a data visualizing software. The most recent GWC Fact Book data can be found on our Data Dashboard page. Student Success Scorecard provides an overview of how GWC students are performing in remedial instruction, career technical training programs as well as retention, completion and graduation rates. This section includes surveys that were administered by GWC's Office of Research, Planning, and Institutional Effectiveness or surveys that were administered in partnership with this office. On September 12, 2014 Golden West College had its first All College Meeting with the purpose of using one day to plan for a year of success. The day was divided into two meetings: The morning meeting focused on updating the College on accreditation, campus safety, new student services and facilities, and strategies for student success. The afternoon meeting was dedicated to departments discussing student equity, educational planning, student learning outcomes planning, and/or strategic planning for the year. Since then, GWC had a total of four All College meetings, with two meetings during the 2016-17 academic year. Below are the evaluations of GWC's All College Meetings. In an effort to provide information on employment outcomes for students who have participated in career technical education (CTE) programs at California community colleges—including whether students became employed within their field of study, if their community college coursework positively affected their earning potential, and why students dropped out of CTE programs—the RP Group partnered with the Bay Area Community College Consortium and practitioners from around the state to develop a universally available survey methodology. Students from Golden West College (GWC) participated in the Spring 2016 National College Health Assessment, a national survey administered by the American College Health Association to thousands of college students across the country each year. The survey is designed to provide college administrators, counselors, health instructors, and college health service providers with detailed data on their students’ habits, behaviors and perceptions on health-related issues. The Committee Effectiveness Self-Evaluation Survey was sent out to GWC faculty, staff, and students serving on campus committees to evaluate all committees in which they are a member of in the 2015-2016 academic year. The questions on the survey asked committee members their meeting attendance and which statement they felt best described the committee they were evaluating from the following categories: results achieved by the committee, ownership/morale, clarity of committee’s charges and mission, team processes, communication, leadership sharing, administrative support, and structure of the committee. The Community College Survey of Student Engagement (CCSSE) is a nation-wide research initiative out of the Community College Leadership Program at the University of Texas at Austin. CCSSE provides campuses with information on student engagement, a key indicator of learning and, therefore, of the quality of community colleges. The survey, administered to students, asks questions that assess institutional practices and student behaviors that are correlated highly with student learning and student retention. The questions are grouped into five themes, also known as benchmarks. • Active and Collaborative Learning: Includes items that capture the extent to which students have opportunities to think about and apply what they are learning in different settings. • Student Effort: Includes items that capture how frequently students engage in a number of activities important to their learning and success (e.g., coming to class prepared, completing multiple drafts of papers, using computer labs). • Academic Challenge: Includes items that address the nature and amount of assigned academic work, the complexity of cognitive tasks presented to students, and the standards faculty members use to evaluate student performance. • Student-Faculty Interaction: Includes items that assess how often students have the opportunity to interact with faculty at the college in meaningful ways. • Support for Learners: Includes items that assess students’ perceptions of support services targeted to assist them with academic and career planning, academic skill development, and other areas that may affect learning and retention. Since spring 2011, Golden West College (GWC) has administered the CCSSE three times: Spring 2011, Spring 2014, and Spring 2016. The next time that GWC will participate in CCSSE is spring 2018. The benchmark scores provided by CCSSE are incorporated into GWC’s Key Performance Indicators for program planning. 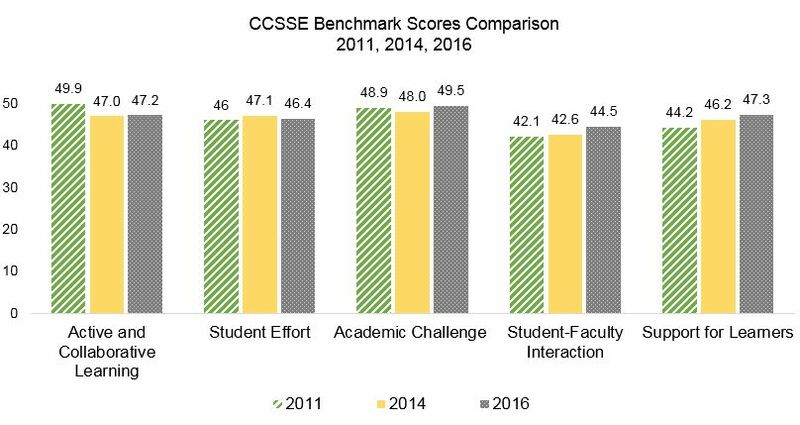 Below is an overall comparison of GWC’s CCSSE scores over the last three survey administrations. For more information regarding each survey administration, please select the respective links. In addition to the five benchmark question themes that are included in the CCSSE survey, GWC also added custom questions to the survey on topics and issues that are specific to students at GWC. The reports below are key findings from these custom questions. The End of the Semester Survey was administered to 3,087 students who were enrolled in 6 units or more during the Spring 2017 semester but have no more than 30 units earned, to help GWC get an idea of areas of strength as well as opportunities to improve. The Personal Assessment of College Environment (PACE) survey is designed to obtain college employees perception of campus climate and provide the college with different data points to promote more open and constructive communication among faculty, staff, and administrators. Questions from PACE survey are categorized into four climate factors that impact student success and institutional effectiveness: Institutional Structure, Supervisory Relationships, Teamwork, and Student Focus (Figure 1). In partnership with the National Initiative for Leadership and Institutional Effectiveness (NILIE), GWC administered the PACE survey during late fall 2014 and late fall 2016. Results from the PACE survey have led to many discussions on institutional effectiveness and changes, including moving the college from a 2-VP model to a unique 3-VP model that integrates different aspects of the colleges (instruction, student services, and administrative services). For more information, please select from the following executive summaries. This iSLO survey was completed by GWC alumni who graduated between 2012 and 2017. The survey focused on the knowledge that students gained during their time at GWC. The Student Learning Dialogue Survey was designed to get feedback from Golden West College faculty on their experiences with student learning. The GWC Chromebook Loan Program is a program supported by Student Equity funds that allows students to borrow Chromebook laptops to help them with their educational endeavors. Various programs offer this Chromebook Loan program to its students. This report includes the responses from 82 students who borrowed Chromebook laptops between May 9th, 2016 and December 13th, 2018. This section includes projects conducted by GWC's Office of Research, Planning, and Institutional Effectiveness or conducted in partnership with this office. Golden West College is currently participating in the Multiple Measures Assessment Project (MMAP), a collaborative effort led by the Research and Planning Group and Educational Results Partnerships’ Cal-PASS Plus and is an integrated effort of the California Community College’s Common Assessment Initiative (CAI). As part of MMAP, incoming first-year students are placed into math, English or English as a Second Language courses based on a combination of their high school grade point average and performances in key high school courses compared to traditional placement, which was based on placement test sores. Peer-Assisted Study Sessions (PASS) is an academic assistance program offered at Golden West College. PASS is currently offered for English G098, English G099, Math G010, and Math G030. Students in PASS offering courses are provided with peer-led assistance from PASS-leaders, who have successfully completed the course or a similar course, in which they are currently a leader. Uniquely, PASS leaders also attend the lecture for the course in which they are a leader. Therefore, PASS leaders can build report with students and know exactly what material was covered in lecture. PASS sessions provide an active learning environment and promotes collaborative learning in which students can compare and discuss lecture notes with classmates and get additional help with their writing or other difficult course concepts. PASS has been offered at GWC for since Spring 2015. Each semester, analyzes of PASS sessions are compared for three groups of students in English G098, English G099, Math G010, and Math G030. The three groups are: 1) students enrolled in a non-PASS offering section of English G098, English G099, Math G010, or Math G030, 2) students who were enrolled in a PASS offering section but did not attend the study sessions, and 3) students who were enrolled in a PASS offering section and attended at least one study session. Sorry for the inconvenience, we are currently updating the website with previous PASS reports conducted at GWC. From time to time, members of Golden West College have received requests wishing to conduct research on campus involving GWC employees or students. In an effort to ensure that study participants are fully aware of the nature of the research, their rights are protected, and that the research aligns with the mission, vision, values and strategic goals of Golden West College, this Internal Research Review Board Form and process is established to protect class time, employee and student rights, and college liability. The following guidelines apply to all external research projects involving Golden West College. An external research project is defined as: "any research project or study which is outside the normal day-to-day operations of Golden West College." A typical example of an external research project is one conducted by a masters or doctoral student who wishes to ask GWC students or employees to participate in a study. Examples of normal day-to-day operations include program reviews, program evaluations, all forms of outcomes assessments, and projects which are part of a GWC course. Anyone - employees, students or external persons - who wishes to initiate an external research project must secure permission through completing the Internal Research Review Board Form. All campus constituents should forward any external research request to the Office of Research, Planning, Institutional Effectiveness (ORPIE). Members of the IRRB will review the application, discuss changes/implications with the principal investigator, and make final recommendations to the appropriate vice president and the College President. A copy of all research findings will be kept in the ORPIE.